I offer private, remote-based coaching and consulting for runners, cyclists and multisport athletes. I enjoy working with any level of experience, fitness or ability towards individual athletic goals. I'm Albert Harrison. Most people call me Bert - but some people, affectionately, call me "Turd." My coaching philosophy centers around the athlete's health and enjoyment of sport. Through hard work and careful planning, I want to give athletes the opportunity to see what they can achieve. I enjoy applying my understanding of exercise physiology and biomechanics when creating workouts and training plans. There is no replacement for hard work -- it may not always be comfortable or enjoyable, but it is often necessary to achieve goals. I am a four time USA Triathlon All-American in duathlon, a three time national champion and an age group World Champion at the ITU's sprint and standard distance duathlons. Before I found duathlon, I grew up running and racing bikes. 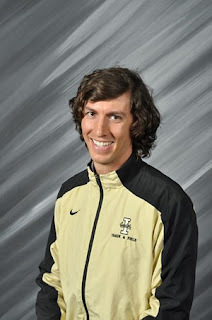 I ran cross country and track at Berry College from 2007-2011. In addition to my experiences as an athlete, I received a masters degree in exercise science with a concentration in strength and conditioning from Appalachian State University in 2015. In my time at Appalachian, I worked closely with coach and physiologist David Morris to examine the effects of different oxygen concentrations on training intensity and cycling performance. Environmental physiology, fatigue, strength training for endurance sport, bioenergetics and sports nutrition remain my primary interests in exercise science. My experience as a scientist has had a profound impact on my training and coaching philosophies. I also have a USA Track and Field, level 2 coaching certification. I have had the opportunity to coach with two collegiate teams. I've worked with numerous post-collegiate runners and cyclists and at all levels; from elementary school kids to weekend warriors, state champions, and Boston qualifiers. Whether you want to improve your sprint speed, raise your threshold power, or run a fast mile; I'd like to help! Pricing is competitive, but will vary depending on the needs of the athlete. We can create a plan tailored specifically to your needs. For more information, contact me by email.